Sunday Book Market, Ronda Sant Antoni, Barcelona. 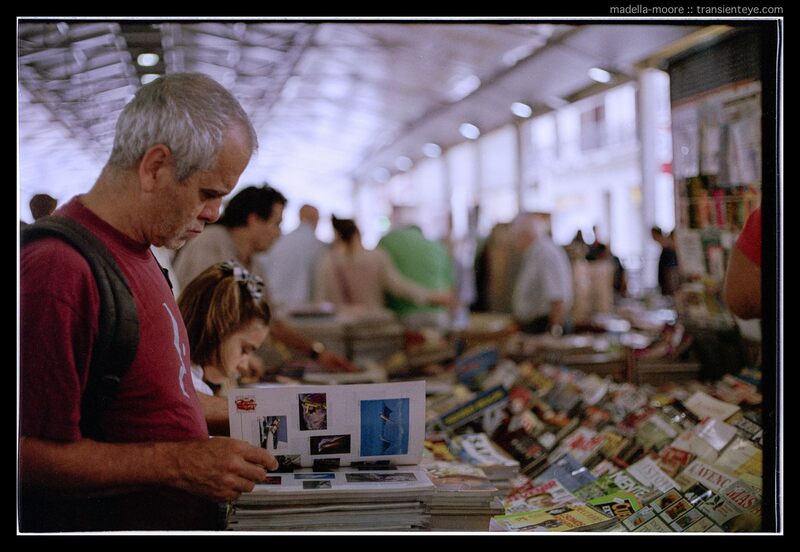 What better way to mark the 100th post here but with a photograph of people browsing the second-hand books and magazines at the Sant Antoni Sunday Book Market, Barcelona. The transition from traditional printed matter to online sources is radically transforming almost all media that we use today. In modern parlance, people no longer simply read books, they “consume content” – a change in terminology that embraces both the increasing number of different media forms and also the notion of disposable hyper-consumption. As media moves increasingly online it becomes a pick-and-choose buffet of short snacks that in some way looses the serendipitous discoveries that you can find browsing monthly magazines or books in a shop. Instead of hungering for whatever media we could find, we now gorge on an unending diet of sugar and fat. Like junk food, this is reinforced by big-business, which is more than ever able to tailor its offerings in order to maximise its profit. Markets like Sant Antoni help remind us of the value of an older era of flawed, obscure editing and writing. Of a time when publication was not solely based on algorithmic analysis of people’s desires or upon the reviews of the multitude on Facebook and Twitter. It is ironic that the biggest failing of online media is its greatest success. The near infinite ocean of information and mis-information in to which we dip has simply become too large. Evaluating things ourselves is hard, so we fall back on tribal instinct and group together with others of similar persuasion. Thereby we ensure that the most basic of human instincts and behaviour come to control the content that we find. The online photographic community is a solid example of this, as much of the dominant content seems to be implicitly more about social status than the craft of making good, interesting images. Blogs such as this form a small but still significant part of this New Media. I am still not sure if this is a good thing or a bad thing.